The Hudson Motor Company's chief engineer Carl Cenzer decided to apply his well-sharpened aircraft design skills to auto bodies in late 1944. After all, he and his company had just spent the last five years working on the war effort and the necessary expertise was there. In 1948, any prospective car-purchaser who came into a Hudson showroom was immediately surprised at how relatively low and wide the cars seemed. That same customer was even more impressed when he/she stepped inside and found immense interior room as well. It was all due to the step-down design. The standard Hudson sedan of the day was powered by a 308 cubic-inch straight six-cylinder engine. It was strong and reliable but not very powerful, only producing 145 horsepower. That engine, coupled to the new body design, provided a combination of smooth power and exceptional handling (in 1951 terms!) not previously experienced in American cars. The Olds 88, Lincolns, Cadillac's and Chryslers could outrun the Hudson, but none could out-corner it. All of this came to the attention of Marshall Teague, an ex-B29 flight engineer and owner of a garage and gas station in Daytona Beach, Florida. It seems that Teague liked Hudsons and had started competing in local sports races at a beach/road course in Daytona. At the same time, a new race-sanctioning body was getting underway, calling themselves NASCAR. Teague had established a local reputation as a winning driver in Daytona and the local Hudson dealer offered to loan him a new '51 Hornet to race in NASCAR's February race. Teague took the car to his shop, tore down the engine to maximize the clearances, tweaked up the valve and ignition timing and promptly won the race hands-down. Recognizing the potential publicity value in winning races, Hudson's management decided to capitalize on Teague's wins and brought him to press conferences. The company's management also realized that the Hornet's engine needed to give the car something better than a 0-60 time of nearly 15 seconds. Hudson's engineering department responded with bigger valves, overbored cylinders, polished combustion chambers, high compression head, hotter camshaft and a dual exhaust manifold. Bolted to the outside was a dual carburetor manifold, called "Twin H". The resulting engine now put out over 160 horsepower and, by 1953, was producing 210 horsepower. In spite of frequent head-gasket blowouts and other mechanical items that would succumb to high stress, Hudson's racing efforts paid off. Hudson was the car to beat in early-50's racing and nothing could outrun or out-handle the Hornet in a race. In 1951 alone, the Hornets won 13 major races in just 9 months. Unfortunately, the very things that enabled Hudson to win on the track were to ultimately spell doom for the company. First, the step-down body/frame that gave such a low center of gravity (thus allowing exceptional handling) also caused the body itself to be very heavy, almost 1900 pounds. The Twin-H Six, as good an engine as it was, simply couldn't produce the torque that the new V8's from the other manufacturers could. It was also heavier than equal-horsepower V8's. There was no way a company as small as Hudson could afford to re-engineer the Hornet body, let alone design a new V8 engine. 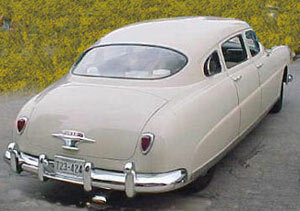 Knowing this, Hudson's management chose to produce a smaller, lighter car for 1953, the Jet. 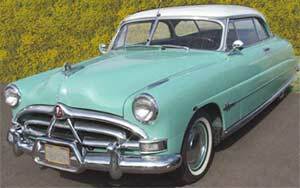 Hardly anyone bought one and, by 1954, the Hudson Company was no longer an independent automobile company. The last car with a Hudson name was made in 1957, the Holiday Coupe. A small but loyal number of collectors cherish the Hudson nameplate. Go to most any local car show and you'll see a Hudson or two. Top-level, show condition 1951-53 Hornet convertibles go for the mid-to-high $30s and even the most common 4-door sedans in the same condition command $15,000 plus. Sadly, the little Jets of 1953 aren't terribly in demand, with restored examples only worth about $7,000.